10-15 ppm Sumagic spray or 1-3 ppm Bonzi drench are effective at controlling growth. Apply as needed. 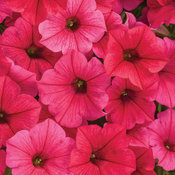 Supertunia Minis may require higher rates of PGRs. Cold temperatures will also effectively control growth. -Supertunia Black Cherry is more susceptible to flower damage from chemical applications late in the crop cycle. -Requires high light in production. -Needs 250+ ppm fertilizer. -Watch pH and EC levels. -Mini Strawberry Pink Veined, all veined varieties and Bordeaux are more sensitive to cold. Keep above 50 F. -Cold temperatures also control growth. -Yellow growth tips often indicate iron deficiency caused by high soil pH. 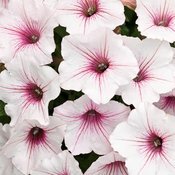 -Do not bring Supertunia petunias in too early as they finish quickly. 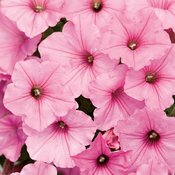 -Many common problems with Supertunia can be avoided if proper crop timing and the appropriate environment are provided. 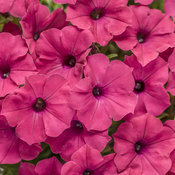 -Supertunia Black Cherry is more susceptible to flower damage from chemical applications late in the crop cycle. -Cooler growing temperatures, high light levels, proper spacing and drier growing practices can be very helpful in managing plant size.